Recently, our town was disgraced by the actions of someone elected to be a voice for our community. With the primary election fast approaching, we are faced with eleven republicans and three democrats vying for this now coveted, vacant position. What makes matters worse is that the discredited former “representative” has decided to run as well. It baffles the mind as to what goes through the thoughts of those, whom have been taken down by their own actions that actually reason it as wise to test the polluted waters that they themselves tainted. Albeit, that the costs of the additional ballot language will be annoying, we need to focus on the issues that matter most to us. We need to deliver the message that this is not a position that we are willing to throw back to the wolf in sheep’s clothing; and show that we are focused on the issues. I usually don’t voice my political views, because I’m not about the fight. My views regarding politics, what works and what doesn’t, comes from years of working in local government and dealing with many government entities throughout my life. I don’t have a lot of faith in those that sit in positions of power, because there have been many times where I have seen self-serving people convince their voter base that they are about the good of the community; however, if the true story be told, it was always a “What’s in it for me?” agenda, hidden strategically behind sarcasms and bullying of those that would stand against them. I have little regard for those that don’t follow the rules. I invite you to read Sean Cantwell’s blog post, “Watching the State Rep Debate So You Don’t Have To” for a candid review of the recent Tea Party gathering of the folks that want to fill this recently, abandoned seat. I invite you to go to the websites of the multitude of candidates and review their history; look at the way they have voted before on issues of concern and look at their attendance records. We want someone that actually shows up to represent us; not find excuses for ignoring the process. Pay close attention to what they, as your proposed-representative, believes is important versus what you, as their constituent, considers significant. Gun control, term limits, marijuana, minimum wage and road repairs are all issues that we all have a common concern about. For me, personally, I think that it should be harder for people to get guns. Although, I believe that we have the right to bear arms, I don’t agree that they should be easy to get. This however, brings other issues to the table; in the form of mental patient rights. We don’t want psychologically unstable people to get guns, yet we are not allowed to know a person’s mental background without their permission. Not all mental illness would negate someone from owning a gun; so there would be the issues of discrimination lawsuits, should the powers that be decide that one’s mental health record must be disclosed in order to be a gun owner. I am not sure what the process is to have a gun; however, I do know that gun companies keep a record of each gun they produce and those identifiers should be in a nationwide database that identifies the owners of each gun purchased. This wouldn’t be the cure-all because, obviously you can’t track all the guns that have been circulating for years; however, it could be an honest start at accountability. I also believe in term limits. No one should be able to make a career out of politics. We don’t want people pushing their beliefs on us, yet we are willing to keep someone in office on the upwards of fifty years and expect growth. As for marijuana, my opinion is based on years of watching people get killed by alcohol consumption. I have never heard of a fatal car accident attributed to cannabis and we don’t have support groups to specifically target marijuana use. I find it odd that we accept that our doctors are prescribing drugs such as Xanax, and Oxycodone to our children, yet when a parent wants to try cannabis oils to stop their children’s seizures everyone is up in arms. I look to the states that have made marijuana legal and I see a surplus of cash in the states’ coffers; as well as a decrease in the amount of prescription drug overdoses within those states. Therefore, I would be wary to vote for someone whose stance is a throwback to the 60’s when our government was experimenting with the likes of LSD. In regards to the minimum wage issue, I understand that it is impossible to survive on a minimum wage job; however, I also understand that a move to raise the minimum wage to an unrealistic amount will virtually tank our society. When everyone that receives the minimum wage increase, it will not increase the wages of those that are not considered minimum wage eligible; those that are already making fifteen dollars an hour will still only be making fifteen dollars an hour. Many will say that this will put more money into people’s pocket. My question is, for how long? The higher minimum wage will cause increased prices for small business to be able to afford the significant wage increase; leaving the recipients in a higher tax bracket and in actuality making less than what they were making before. Those that don’t experience the increase will be forced to pay the higher prices incurred by this change. I understand that we need changes; however, changes that are not well thought out can result in stepping backwards as opposed to moving forward. As for our roads around the state, I feel that we have had our fair share of state funds over the past two years; however, if we are going to be able to fix the roads state wide, we need something other than another tax increase. We need to look to the states that have set benchmarks that we need to consider. Maybe we should consider not cutting off our nose to spite our face in regards to marijuana legislation and accept that this may be a viable way to get our roads fixed and have more funding for our schools. I don’t expect people to agree with me; however, I do expect the voters to do their homework. The law does not state that you have to vote for every seat on the ballot. If you don’t know whose running, no law says that you have to actually select anyone. How many times have you voted for someone in a school election or elected a judge for the higher courts and not known anyone that was running? Many vote a certain party because that is the party that their family has voted for decades; others vote because their friends say “so and so” is the best candidate and few vote from doing their homework. When we do this, we find ourselves in our current situation, wondering what the hell went wrong and slinging arrows at those that didn’t get it right. We all have the right to vote; however, many do not realize the responsibility that comes with that privilege. We owe it to ourselves to know the candidates, question their ethics and expect transparency. We owe it to our community to make responsible decisions that are void of personal gain. We owe it to our nation to start paying attention; because those that end up in the highest ranks in government started on the ground floor of their municipality. Being a resident near the downtown area I knew how to stay out of the way of the drivers that were “passing through” our town; finding the little short cuts that the non-residents didn’t know about. Being able to sidestep some of the insanity did help to lighten the madness as the various road projects progressed. Most people I encountered were polite, allowing you to slide in off a side street entrance or business driveway. Then, of course, there were those that wouldn’t give an inch. You could see the stress on their faces as they were intentionally ignoring you; blocking the intersection in order to ensure no one actually got a car length ahead of them. At one point in my life that would have annoyed me; instead, I sat remembering what it felt like to have that type of anxiety and politely smiled, knowing that it wasn’t up to me to judge why they were feeling the way they were feeling. You can see the mix of resignation, irritation and for some, that “just going with the flow”; smiling their way through it. For me, the years have taught me that you can only go as fast as the guy ahead of you and you have to be good with that; otherwise you rob yourself of an inner-peace that comes with acceptance. I have many memories of a younger me losing my mind over other people when I was driving. I am so very grateful those days are behind me, praise the Lord. With our main north/south thoroughfare being overhauled, certain inconveniences come to mind. Outside the obvious with the road closure, I can’t help but wonder how many sleepless nights did those living closer to the project have to endure; with the constant, rhythmic, thunderous thump of some earth pounding machine in the middle of the night? I know there was a certain logic as to why they were doing it at night, however, I’m sure that logic escaped the homeowners that were within a quarter-mile of the project. The final result of the project includes a bridge and an underground pedestrian tunnel; which has brought out all types of social media theories, ranging from better usage of taxpayers money to envisioning a future place for the homeless and the dregs of society to hang out. You could say that almost everything is a waste of some taxpayers’ money at some point; however, this time those “wasted” funds went to help our town out. The time and money was spent here. As I observe people complaining that the roads around the state are falling apart, I can’t help being a bit thankful that they are fixing ours. On the other side of town, another project led many to question as to whether we needed a round-about in our town. The answer is probably not, and many would agree that a light would have likely been sufficient; however, whether we liked it or not, we were going to have to roll with the punches. However, there was no punch to this one. No-one likes change, and the roundabout was a change. We are getting used to it. These improvements to our roads and infrastructure, in a time where many towns are in serious need of the exact enhancements that are happening in our town, are something I am personally thankful for. Yes, we have had to endure a lot of inconvenience over the past two years; however, I cannot find any argument that overrides the fact that our town has been enhanced by these projects in a state and a nation where our infrastructures are outdated and hazardous. The new bridge and pedestrian tunnel, as well as the roundabout, may not be everybody’s cup of tea and there will always be those that will fight to the bitter end to tell you how ridiculous everything is in life. The reality, at least in my mind, is that the taxpayers’ money was “wasted” in our town; those “wasted” funds gave us new infrastructure that should last a while and it has helped to beautify the roads that travel through our town. In my world, that is a win. Next summer, when all these road construction horror stories are well behind us and we are enjoying the newness of our roads, we will have new concerns. Interacting with drivers will still remain an experience that embraces courteousness and those special “What the hell?” moments. At least with some degree of certainty, you will know when you are driving through Lapeer that you should be able to do it without blowing out a tire. Ah, the things to be thankful for in life. My husband and I recently returned home from a visit with our sons’ family in New Jersey. 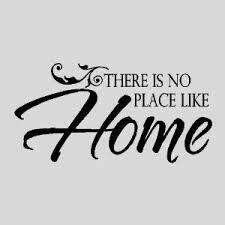 The old adage that states “there’s no place like home,” albeit, fairly true; had somewhat escaped me this time as I have felt a little hollow on these days following our return. The challenges of our lives have weighed heavily upon us over the past decade. This quality time spent with our family allowed us to focus on our blessings in life. For that brief period, we were able to detach from the battles at home and become a part of our sons’ life. We became alive with the responsibilities of three young boys in order to give mom and dad a break. Our mornings would begin with the baby, who is six months old, whimpering in his bed that he was ready to start his day. I slept in the room with him, and due to his teething, had several encounters with him on almost a nightly basis. Every morning his smile would wipe away any weariness from the night before. My husband and I were like a well-oiled machine, ensuring that each child’s daily backpack was ready for the individual adventures at school. Even the baby had his daily routine of going to a wonderful child-care center located close to their home. I would make sure that their lunches were packed and ready for the day. As I would feed the baby, my husband would feed the two older boys (three and six) and ensure that they were dressed and ready in time to head off in different directions, ensuring that each one arrived at their proper destinations on time. When we first arrived, we were not aware that the baby would be gone during the day as well; therefore, perplexing us as to what we were supposed to do with the eight, long hours before we would be with the boys again. Our son and daughter-in-law were on a cruise celebrating their tenth wedding anniversary and therefore, it was my husband and me, with time to spend together. We watched shows, went out to eat a couple of times and enjoyed each other’s company; communicating without the normal interruptions of life that occur in our home. We started a journey to quit smoking while we were in a non-smoking environment; and although we have yet to throw them down completely, we are down to five cigarettes a day. We have three more cigarettes (each) and I haven’t bought another pack. I have quit before; however, I did it by throwing them down completely. I am not a fan of “weening” down; however, my husband was not comfortable with the idea of quitting cold turkey. We both feel that we are breathing better, and to be honest, I could have paid for an island by now when you consider I, alone, have been smoking for close to forty years. We would begin to start the second part of our day around four in the afternoon; grandpa running down to the bus stop to pick up the boys and grandma heading down the street to the childcare center to pick up her “chunky monkey.” We would converge on the house within minutes of each other; back packs being collected, shoes getting kicked off, homework being checked out, and starting dinner so that they could eat by five. Once the whirlwind calmed down and dinner was eaten, the boys were given time to play before going upstairs to get ready for bed. I would change the baby and have some “tummy time” with him; the memories of his loving smile still warming my heart. Friday night was movie night; celebrated with popcorn and the works; creating happy, tired, little boys who were absolutely thrilled that they were able to stay up for an extra hour, past their normal bedtimes. They would crawl into bed, almost asleep before their heads hit their pillows. It’s always bittersweet when it comes time to return home. Each time is hard. This time, however, as bittersweet as it is, I feel refreshed and I believe my husband does to. We are still somewhat within a war at home; a battle we have fought for many years; however, this time we are coming back with a refreshed spirit. Sometimes we need to connect with those feelings and loved ones that add value to our lives. Sometimes we need to be washed with the recognition that life is not about fighting every war or worrying about what others’ think of your situation. Sometimes life is just about experiencing life. As I sit here in my home, reflecting on the past couple of weeks, I feel like I am ready to move forward. Smoking will be a thing of the past within a day or two. This is a journey that is definitely better with a partner. My heart is lifted as I reflect on the blessings in my life. Leaving home was wonderful; however, being home allows me to understand how we see our blessings; many times not realizing their importance until we are separated from them. While scanning social media today, I discovered that a new bakery has finally opened in the downtown area. This news would cause me to pause as my mind went back to a time when there were no bakeries in your local grocery mega-stores; where the smells get lost in the vastness of the building that houses the little areas of our lives that use to be exclusive to neighborhood businesses and downtown charm. 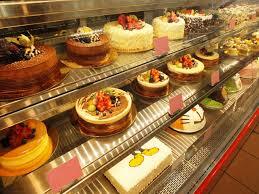 The thought of a bakery brings back memories of a quieter and gentler time. I envision the enticement of approaching the cobalt-striped, canopy-adorned, window; displaying an assortment of freshly baked goodies that are gently calling my name. I imagine opening first, the screen door; hearing the creek of the aged hinges as I push open the white-ruffled curtain-adorned French-doors that lead into this heavenly and tasty realm. Immediately, my senses are immersed in the wonderfulness of flavors that permeates the air of this modestly adorned area. The cinnamon, nutmeg, and pumpkin spice melded together with the smell of coffee that was offered to the customers who may want to eat their tasty indulgences on-site A white, linen, table-clothed, bistro-type table is sitting inconspicuously to the left of the front door as well as outside in a charming alfresco setting. 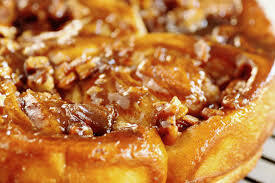 My eyes behold a host of feather-light crullers, enormous gooey pecan rolls, freshly baked sweet-breads and plate-sized cookies; all sitting enticingly on their paper-laced doilies displays a beautiful array of scrumptious, homemade goodness. Behind the counter, I recognize a friendly face and a memorable smile. This lady is a neighbor and a local business woman; a loving grandmother of three, dotingly baking and serving life-long and new customers with the same warm care she would give a family member. Her husband is happily sharing a friendly story of a recent fishing trip with another pal and patron. We have a little chat about how nice it was to have fall approaching and how fall this year has inspired a new “pumpkin spice” doughnut that, when paired with a tall glass of locally-grown, sweet apple cider, will quickly become a ritual to prepare the locals for the harvest-time festivities that would ensue before the Christmas time holidays are upon us. There was a charm in experiencing a warm and inviting neighborhood bakery; and the thought of one gracing our downtown area again warms my spirit for this town that I have called home for a good portion of my life. We need to remember and preserve our downtown history. We need to show our children what life was like before superstores and the focus on non-stop convenience. We need to slow down our dead-heat run to the grave. Life was not meant to be flown through at break-neck speed; it was meant to be tasted and savored. As we move forward and evolve as human beings; we risk losing touch with the little niceties of the life we lived, before convenience took over. If our children don’t experience it, they won’t share it; and that’s how traditions die. I know that our community will help to ensure that this piece of Americana will thrive. We need to remember the sweet parts of life; and to me, nothing defines sweet like the sweet aroma’s and feelings that one gets when they walk into a true, gingerbread house of scrumptious deliciousness and thought provoking remembrances’ of a time gone by.